Korres Greek Yoghurt Advanced Nourishing Sleeping Facial is meant for skin that needs a boost of moisture. It contains Greek Yoghurt extract that adds moisture to the skin and gives a smooth, even appearance to the skin. I have oily-combination skin that tends to get a bit dry during the winter months. I find this mask to be similar to a heavy cream - a little goes a long way with this product - but despite containing ingredients like beeswax in it, the mask absorbs easily into the skin, and I wake up to perfectly moisturized skin. It does a spectacular job of banishing any dry patches without causing any breakouts. I did notice a bit of skin sensitivity a couple of times over my cheek bones and nose while using this product, but it's not happened with every use, so I amn't sure if it's because of the mask or because of my skin just being sensitive those days. 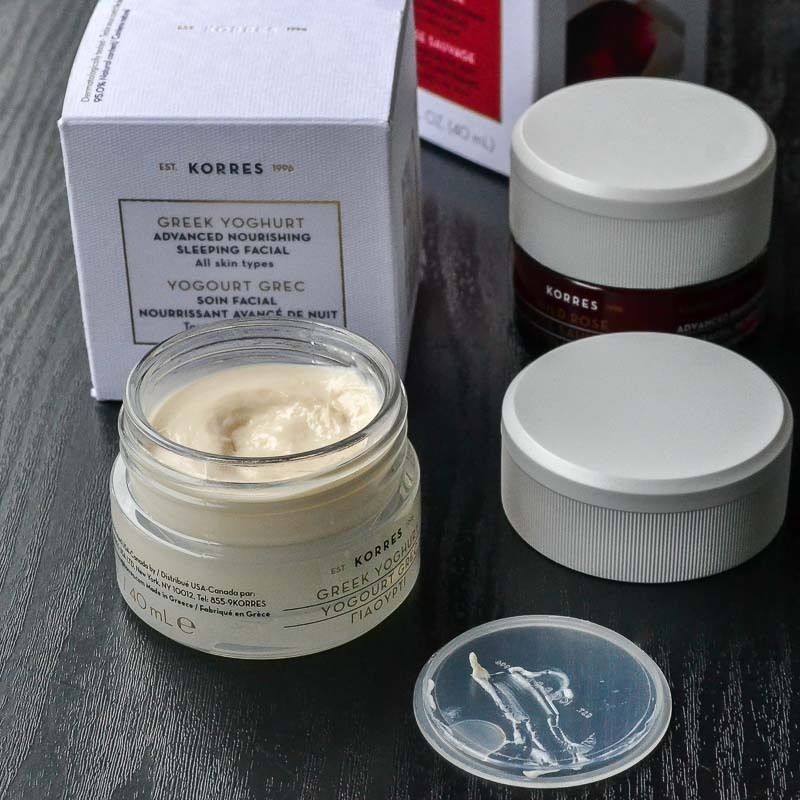 The Korres Greek Yoghurt Sleeping Facial seems like a good pick for those with normal-dry skin, and perhaps occasional use (when skin is feeling a bit drier than usual) for oily-combination skin types. Korres Wild Rose Advanced Sleeping Facial targets uneven skin tone and works overnight to improve skin texture and luminosity. It contains wild rose oil and super C (stabilized fat soluble vitamin C with 10 times higher vitamin C absorption) for brightening and antiaging effects as well as rose water and Imperata cylindrica extract for hydration. 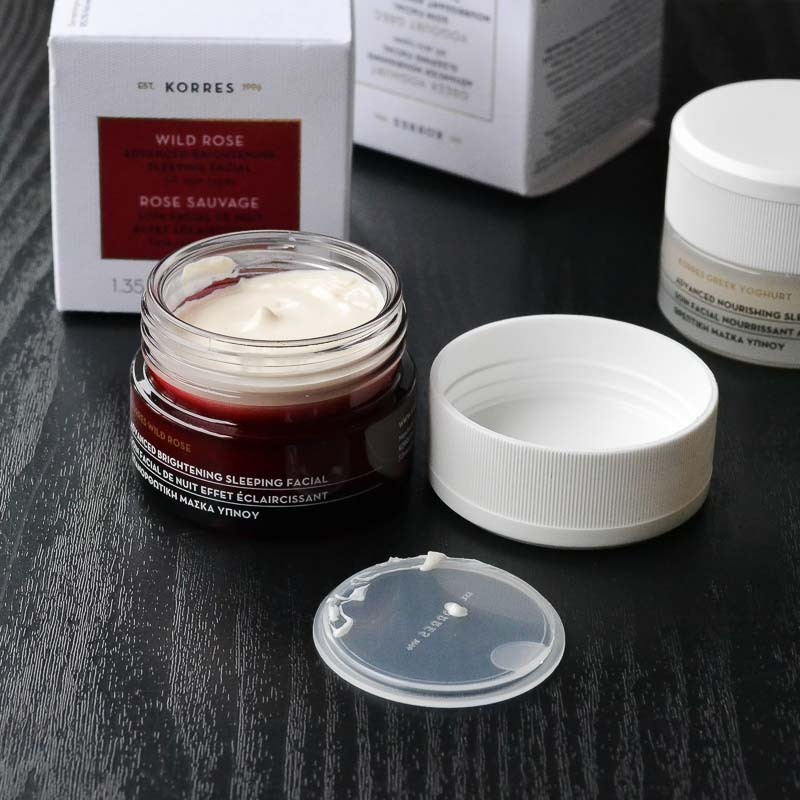 The consistency of the Wild Rose Sleeping Facial - much like the Korres Greek Yoghurt mask - is like a night cream, though this feels lighter than the Greek Yoghurt mask. The cream glides on quite smoothly on the skin and absorbs readily into the skin, and I wake up to skin that looks brighter and healthier. I haven't had any breakouts or skin sensitivity with using this mask either. 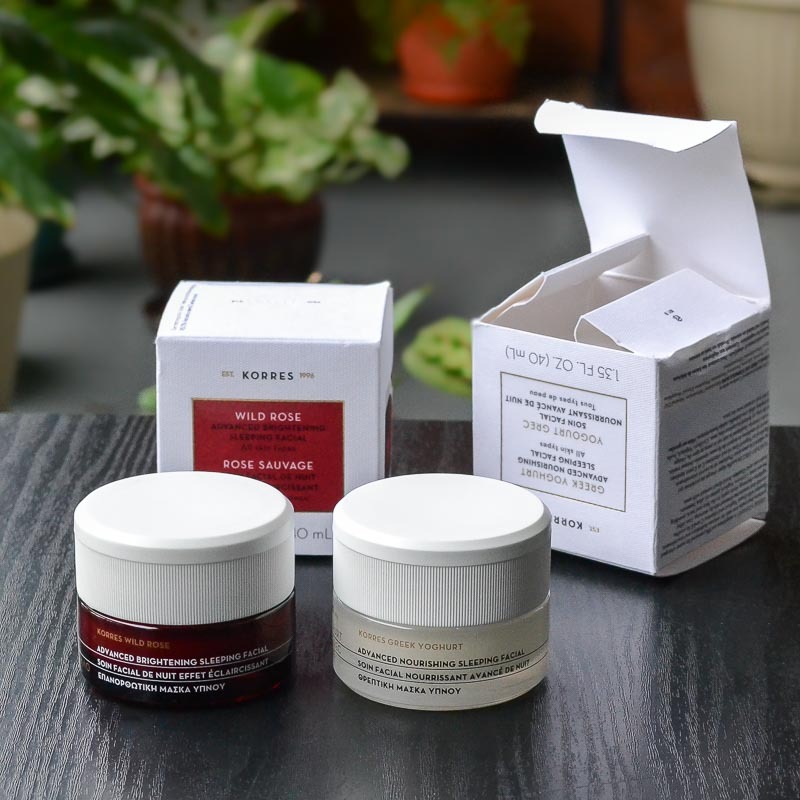 Overall, I do think the Korres Wild Rose mask is a better pick for normal-combination skin types and/or for those looking for an everyday brightening treatment. Both the overnight sleeping facials - Wild Rose as well as Greek Yoghurt - leave a slight residue on the skin,with a silicone-like (they DO NOT contain silicone, though) feel to it that's more obvious in the Greek Yoghurt mask, and I think that's one reason why both these work great as overnight masks. Not only do they provide effective moisturizing and brightening ingredients, they also do a good job at creating a barrier to avoid skin getting dehydrated through the night. Each person's skin is unique, with different needs, but I find such masks to be more effective on my skin than gel-based sleeping masks that disappear into the skin. Depending on how my skin is feeling, I alternate between these two masks - the Korres Greek Yoghurt mask for days when my skin is feeling a bit dry and the Wild Rose brightening sleeping facial for regular days. 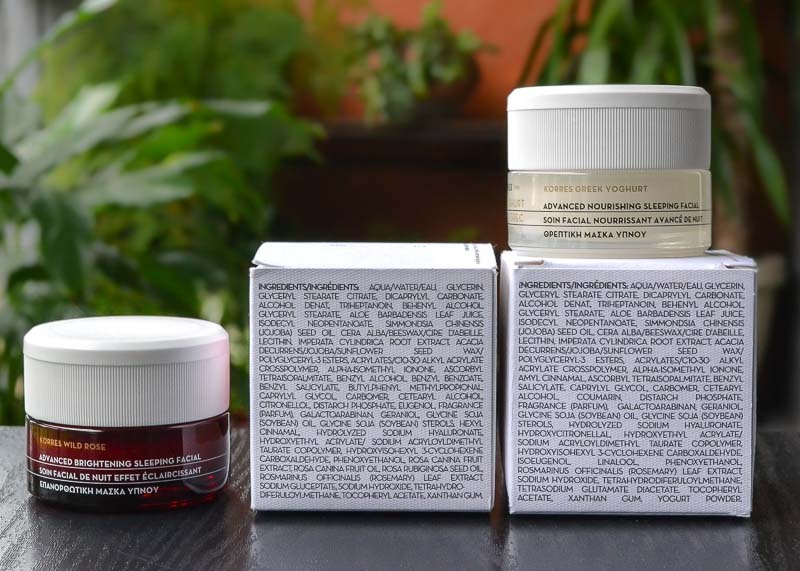 The only downside I find to these facials is that both these products are quite strongly fragranced, and while I am quite tolerant of fragranced skincare products, I would have prefered the scent to be a little less strong. Overall though, two simple, effective, and supereasy to use products!